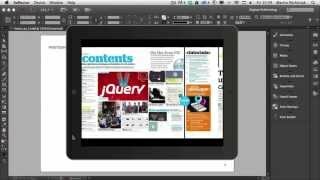 This is the second episode of a series about Digital publishing with Adobe InDesign CC. In this part, we all the different types of interactive documents you can create using Adobe InDesign CC cover. Let’s take a close look at the files, Interactive Pdf forms, PDF, SWF presentations, EPUB ebooks and DPS apps and compare their advantages and disadvantages. Let’s start! Nice tutorial, very useful stuff. Thank you for informative video. Thank you! very informative. Lots of useful information. The interactive PDF can be read in other programs other than ACROBAT? can a cart be created where you click on a product and it goes to a cart? Didn’t actually show HOW to do create, for example, an interactive TOC. He just went through an InDesign interactive document he already created and showed how his works. I made ebook which has a lots of texts but not much images. The book originally uses MS word so I convert it to PDF and place it to Indesign. do you know how to protect text quality ? Will it work on Android…..
Great video! I am busy with a long form product catalog. This is exactly what I was looking for. Is it possible to make a interactive .pdf (for desktop use), a SWF format (to embed on our webpage), and a printable PDF all for the same document? Thanks a lot for good video! Thanks, it was really useful. I’ve already seen the Buttons and Animations Tuts’ videos, however, it would be great if you show us the other ways we can create the Digital Publishing you mentioned. Nagyon rendbe volt. Szépen, tisztán beszélsz. Csak így tovább. Nem néztem meg az egészet csak egyes szegmenseket de soha ne feledkezz meg a Pc-t használókról. Ők nem készíthetnek semmit az Apple app store-ba amíg nem vesznek egy Mac-t is. how do you get this ipad Emulator that you are using in that Video? Is it from Adobe?